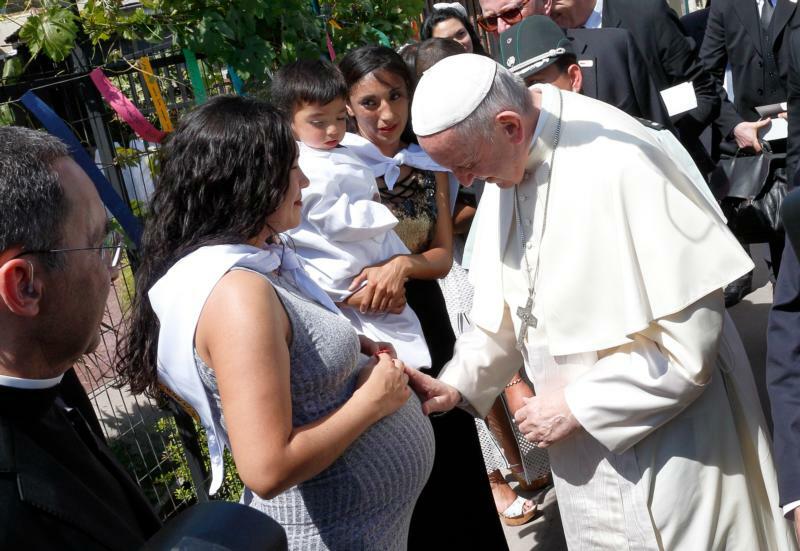 SANTIAGO, Chile (CNS) — When mothers are in prison, “children are the ones who suffer the most,” a female inmate at San Joaquin Women’s Prison told Pope Francis Jan. 16. “Nothing and no one can replace a mother,” the inmate, Janeth Zurita, told the pope on behalf of the hundreds of other women in the prison. Pope Francis has visited other prisons, but this was the first time on his travels as pope that he visited one just for women. He was greeted by women standing with their babies in their arms. He stopped and spoke to one woman who was seven-and-a-half months pregnant and touched her stomach to bless her unborn baby. The prisoners can have their children with them until they are 2, then they must hand them over to another member of the family to look after or, if no one is available, the children go into the care of the state. The inmates have been preparing for the papal visit for months. They composed a special song for him and hung brightly colored paper ribbons from the ceiling of the gym where he met them; each ribbon had a quote of inspiring words Pope Francis had spoken at previous prison visits. The women greeted him with smiles, tears and more babies dressed in their best clothes, who were passed to the pope for hugs, blessings and kisses. Sister Nelly Leon, a member of the Sisters of Our Lady of Charity of the Good Shepherd, has been chaplain at the prison for the last 13 years. She welcomed Pope Francis and told him she believes inmates are the people who are most forgotten by society. Sister Nelly runs a charity called Mujer Levantate (Woman, Get Up), which helps former female prisoners get back on their feet through work and a special shelter. Pope Francis deviated from his original speech and repeatedly told the women they must demand their right go back into society with dignity and not to forget their hopes and dreams. He praised the prison guards for treating the women with dignity and added that dignity, like the flu, was contagious. He also spoke of the importance of motherhood and the gift of children. “Many of you are mothers, and you know what it means to bring a new life into the world,” he told them. “You were able to take upon yourself a new life and bring it to birth. Motherhood is not, and never will be a problem. It is a gift, and one of the most wonderful gifts you can ever have. The inmates and Sister Nelly asked the Chilean government to change its system so that children do not have to suffer unnecessarily and can remain with their mothers. Pope Francis acknowledged that suffering. President Michelle Bachelet was at the ceremony and listened with interest, but she will be replaced in March by President-elect Sebastian Pinera. The importance of forgiveness was another theme of the visit. Zurita asked for forgiveness for her crimes. She is scheduled to be released from jail after serving time for drug trafficking — the crime for which most of the women are in the prison. Pope Francis said everyone needs to learn the importance of truly seeking forgiveness. “We all must ask for forgiveness; me first,” he said. Contributing to this story was Junno Arocho Esteves in Santiago.